Grasping and implementing the guideline by the Central Military Commission and the Ministry of National Defence on the work of education, management and practice of State’s law and military regulations and discipline, over the past years, party committees and commanders at levels in the entire military have actively carried out this work and achieved positive results. Military cadres and troops fully perceive the significance, influence and necessity of observing State law and military regulations and discipline. Responsibility, capability of cadres at all levels regarding organization and management of troops have been raised. Troops’ sense of awareness has improved in a number of aspects, particularly in observance of commands, directives and regulations. Units have stringently followed daily and weekly regulations. Investment has been gradually made to improve the facilities for accommodation, study, daily life, working and training. The work of managing strength, weapons and technical equipment has been carried out in an increasingly close manner. A part from regulations of the State’s law and military discipline, due attention has been paid to educating troops to obey rules for social activities and public order. Basically, military culture and image of “Uncle Ho’s soldiers” have been expressed and bolstered during cadres and troops’ social activities. The percentage of violations of military discipline has decreased, thereby contributing to making the military “revolutionary, regular, elite, gradually modern”, meeting the requirements of national protection in the new situation. However, in recent times, there have still occurred serious violations of State law and discipline in the military leading to loss of life, and labour, training and traffic accidents. Due attention has yet to be paid to grasping and performing duties, conforming to work regulations, and maintaining regularity. Several cadres and technicians’ capability to manage troops and facilities, weapons and equipment is still limited, particularly at grass-roots levels. There have existed troops’ violations of military uniform and etiquette; a number of troops’ self-improvement has yet to be high. Importance has yet to be attached to the work of guarding, managing, registering and recording weapons and equipment at levels. The above-mentioned shortcomings result from both subjective and objective reasons, but mainly from the subjective ones. Objectively, it is the dark side of the market economy and social evils that has partly negatively impacted on awareness and lifestyle of a proportion of soldiers before and during their military service. Subjectively, responsibility of command staff at all levels in the work of discipline education and management has yet to be full. The work of education and persuasion has been carried in a simple, dogmatic manner and not relevant to units’ condition. Due attention has yet to be paid to improving troops’ knowledge of State’s law and decisions, directives and guidance regarding the practice of military discipline and State’s law. Units’ building of military cultural environment has still witnessed formalism. Proper regard has yet to be paid to raising troops’ awareness and building their etiquette and lifestyle. Besides, a proportion of cadres and party members, particularly commanders and commissars directly in charge of managing troops at levels, are irresolute in implementing the task, not capable enough of managing troops. Management of troops and their ideology is still bureaucratic; management of facilities, weapons and equipment is not on a close basis. Meanwhile, a number of cadres are not exemplary, not strictly dealing with violations, dishonestly reporting those to higher echelons. To strengthen the work of discipline management and education, prevent and reduce violations of State’s law and military discipline, command staff at all levels should focus on the following solutions. First, enhancing the capability of ideology and discipline management of party committees and command staff, particularly commanders and commissars at all levels. On the basis of functions, tasks, and characteristics of groups of soldiers and area, functional agencies, party committees and commanders at all levels should review, supplement and complete the system of documents for leadership and direction and regulations within their jurisdiction. Agencies of Military Training, Propaganda and Training, Inspectorate, Criminal Investigation, Military Security, Information Technology, and Inspection Commissions should further promote their role in counselling, guiding and directing party committees and commanders of agencies and units in the work of discipline education and management. Great importance should be attached to education of State’s law and military regulations and tradition to render cadres and troops fully aware of the significance and necessity of observance of State’s law and military discipline as well as regularity building. To that end, command staff at all levels should formulate contents and forms of education on the basis of the particularities of units’ situation, tasks, and operational area as well as the issues directly pertaining to cadres and troops’ discipline observance. Contents of education must be comprehensive, systematic, and unitary. Great importance should be attached to improving every soldier’s knowledge of State’s law and military discipline, such as the Directive 37/CT-ĐUQSTW by the Standing Board of the Central Military Party Committee (the present-day Central Military Commission), the Directive 85/CT-TM by the Chief of the General Staff on military regularity building, the Soldier Management Regulations, the Line-Up Regulations, the Directive 04/CT-BQP, dated February 9th 2012, by the Minister of National Defence on strengthening discipline education and management, and preventing violations of State’s law and Vietnam People’s Army discipline, the Directive 91/CT-BQP, dated October 8th 2015, by the Minister of National Defence on strengthening leadership and management over the work of traffic safety in the Military, the Directive 91/CT-BQP, dated November 22nd 2016, by the Minister of National Defence on strengthening management and education of discipline regarding the Vietnam People’s Army, the Circular 192/2016/TT-BQP, dated November 26th 2016, by the Minister of National Defence, regulating adoption of disciplinary forms and procedure, prescription, duration and jurisdiction of handling violations of discipline in the Ministry of National Defence. During the process of education, it is necessary to opportunely compliment and reward individuals and units strictly complying with regulations on regularity building and discipline practice, and multiply typical examples. At the same time, it is essential to warn of and analyze troops’ wrongdoings and pragmatic, self-indulgent and irresponsible lifestyle. Second, enhancing the capability of soldier management of cadres at all levels. To this end, cadres at all levels should regularly improve their capability and method of soldier management. Cadres must have political willpower, pure morality, healthy lifestyle, good professional competence, being exemplary in the practice of discipline, while thoroughly perceiving and accurately executing their responsibilities and tasks. Command staff at levels should facilitate inferiors’ self-improvement and lay down various measures to enhance the capability of soldier management. Agencies and units should stringently maintain regulations on cadre training according to their level and develop training plans for each training period and the whole year. Superiors must directly train their inferiors both in professional knowledge and working method. Contents and forms of training must be in line with operations of the units. Due attention should be paid to training the method to organize activities, particularly those during break time and on holidays to attract troops’ participation but still maintain readiness for combat. Simultaneously, there is a need for combining soldier management with management of weapons, equipment, facilities, finance, and property. Cadres at all levels must be exemplars of observing State’s law and military discipline for inferiors to follow, while strictly maintaining regulations on regularity, military uniform and etiquette. Third, innovating contents and method of education in accordance with each group of soldiers. 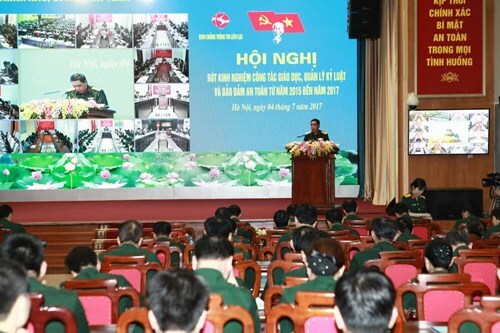 First and foremost, it is necessary to carry out the annual program for propagation, dissemination and education of State’s law and military discipline via various forms in combination with the implementation of the “Determined to Win” Emulation Movement, training and regular tasks. Party committees and commanders should lay down guideline and measures for leadership over the ideological work and anticipate arising issues within their units, while regularly drawing lessons on the ideological work and the work of discipline management. Political agencies at all level should proactively grasp the ideological situation of troops and give sound advice to unit commanders on solutions to ideological issues that potentially lead to violations of discipline. When the signs of discipline violation appear, it is necessary to make detailed assessment and focus on instructing units to completely deal with violations, take education and persuasion as the main solution, and adopt synchronous and tough measures to handle repeated violations. Unit commanders should grasp and comprehensively manage social relationships of their soldiers, opportunely detecting their unusual signs, such as spending beyond their means, borrowing money with high rate of interest, risky business, to take preventive and remedial measures. Fourth, stepping up the work of regularity building and discipline training within units. Command staff at all levels should introduce and implement resolutions of party organizations, documents of functional agencies, and directives of unit commanders on regularity building and discipline training. It is necessary to strictly maintain regulations on regularity building, discipline training, weapons and equipment management in the tasks of training and combat readiness, especially during drills, live fire tests, etc. When a soldier violates discipline, unit commander must analyze the violation in detail and settle it under the Soldier Management Regulations and the Circular 192/2016/TT-BQP, dated November 26th 2016, by the Minister of National Defence. Settlement of violation must be in an objective, proper manner and opportunely reported to superior commanders and functional agencies. Discipline serves as a factor that builds up our military’s combat strength. Discipline practice represents a principle in building the military and acts as good tradition of our military. Strengthening the work of discipline education and management is an important, regular task of party committees and commanders in the whole military to meet the requirements set by the cause of building the military and protecting the Homeland in the new situation.